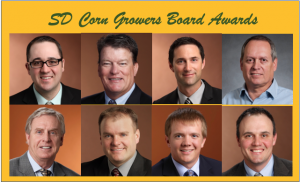 SIOUX FALLS – The South Dakota Corn Growers Association (SDCGA) honored seven retiring board members for their service Jan. 19 during the organization’s 33rd annual meeting at the Sioux Falls Convention Center. Five of the seven served on the SDCGA board: Keith Alverson of Chester, Steve Halverson of Pierre, Troy Knecht of Houghton, Mike Nickolas of Aberdeen and Bob Schmidt of Pierre. The other two served on the South Dakota Corn Utilization Council: Reno Brueggeman of Miller and Nick Jorgensen of Ideal. In addition, Presidential Recognition Awards were presented to Knecht for his years of service as SDCGA president and Ryan Wagner of Roslyn for his years as president of the South Dakota Corn Utilization Council president. Wagner will complete his final presidential term in March but will remain on the board of directors. He and his wife, Kerri, have three children: Grady, Anna and Harrison. om 2007-10 and was vice president. He took his talents to the national level, getting selected to the National Corn Growers’ Ethanol Committee for three years and serving as chairman and vice chairman. He also served on the NCGA board of directors, completing his second and final three-year term in September. The national board has only 15 members so it’s a big accomplishment for a South Dakotan to get selected. He was a face and voice of corn farmers throughout his years of service, doing countless newspaper, television and radio interviews on various agricultural issues. He and his wife, Kari, have a daughter, Kennedy, and two sons, Connor and Caiden. Steve Halverson of Pierre has served on the SDCGA board since 2016. He is committed to conservation and soil health and has been a strong advocate for sustainable farming practices. He participated in South Dakota Corn’s “This is Farming” campaign – featured in videos and ads touting the benefits of no-till farming, cover crops and other conservation practices. He also serves on the South Dakota Habitat Conservation Foundation’s board of director. In addition, Steve spent 13 years on the South Dakota Wheat Commission board and was chairman of Rails to the Future, leading a successful grassroots effort to rebuild the rail and restore rail service between Chamberlain and Presho. He and his wife, Connie, have two daughters: McKenna and Macy. Troy Knecht of Houghton joined the SDCGA board in 2010 and served as president the past two years. He embraced that leadership role and represented the association at numerous national hearings and meetings over the years. During his years of service, he’s been involved in a number of discussions with our U.S. senators and representatives as they sought input and ideas on agricultural issues. When our association joined with others from the ethanol industry to hold a Sioux Falls rally in support of E15 and against EPA policies, Knecht was one of the speakers who helped us generate attention for our cause. He also serves on the American Coalition for Ethanol’s board of directors. , Mataya and Livia, and a son, Reeve. Mike Nickolas of Aberdeen was an industry representative from Agtegra Cooperative, where he served as executive vice president and chief operating officer of the grain division. He has more than 25 years of experience managing South Dakota grain assets, previously working for South Dakota Wheat Growers and North Central Farmers Elevator before the two unified to form Agtegra. He and his wife, Rose, have four grown children and three grandchildren. CSA in 1990. Schmidt has also served other organizations, including the South Dakota Ag Foundation, the South Dakota Value-Added Foundation and the South Dakota State University Board of Governors. He and his wife, Carla, have two adult children: Krista Sarvis and Anne Kvamme. Reno Brueggeman joined the SDCUC board in 2013 and quickly moved into a leadership role. He served as vice president and then took over as president for two years. he board dealt with that topic. His input helped the board craft a detailed position on crop insurance that was presented to Sen. Thune and his staff as they drafted a new farm bill. Brueggeman believes farmers should speak out to help non-farmers learn more about agriculture and he was a vocal leader in that regard. He and his wife, Laura, have a son, Derek, a daughter, Bailey and triplets Colby, Brynlee and Ashlyn. Nick Jorgensen has served on the SDCUC board since 2014 after graduating from South Dakota State University with a degree in agricultural business and a master’s degree in economics. Jorgensen has a deepinterest in precision agriculture and made an exceptional presentation when we went before the Legislature with a proposal to build a precision ag center at SDSU. His economics background was an asset in that endeavor. He was a strong supporter of research projects at SDSU’s ag college. His service goes beyond the corn board as he serves on the Farm Credit Services of America board of directors. Nick and his wife Ashley have two sons, Hayes and Porter.